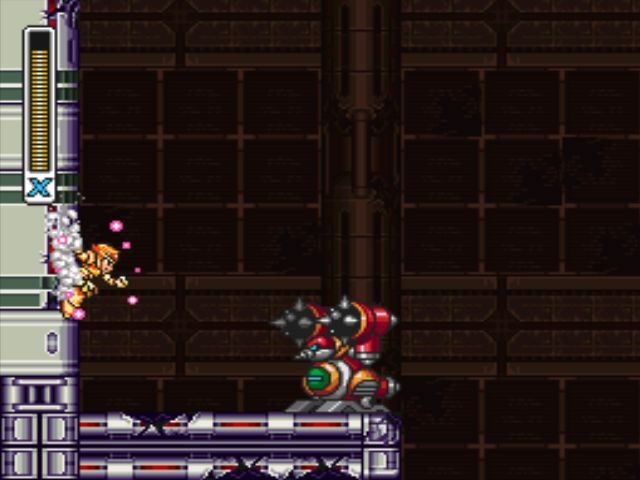 The enemies you fight here will be different depending on if Vile is alive or dead after your fight with him. Head right to find a new enemy if Vile is dead. This is a more powerful version of the Victoroid. He shoots faster, and can shoot a flurry of lasers and bombs. Do enough damage and his enhancements will be destroyed, leaving just a regular old Victoroid with a new coat of paint. Head right and up past the Victoroids and Caterkillers, (or more generic enemies, most notably including Hamma Hammas, if Vile is alive) then right past more Victoroids (or not). Keep going right and you'll find a Ride Armor platform. If Vile is dead, there's water ahead. There, have mnemonic device, on me. In that case, summon the Frog Ride Armor. Go underwater and blow up the turtles. If your Ride Armor is about to fall into a hole, jump out of it. You won't really need it for long. If there's no water, use the Hawk Ride Armor, or just no Ride Armor at all. There are some pretty big pits here. Climb out of the water or not water and, if Vile is dead, don't go into the boss door. Skip this whole part, including the boss, all the way down to the section about the Escanail, if Vile is alive. If he's dead, you can murder Zero and steal his sword now! I mean, really, right? 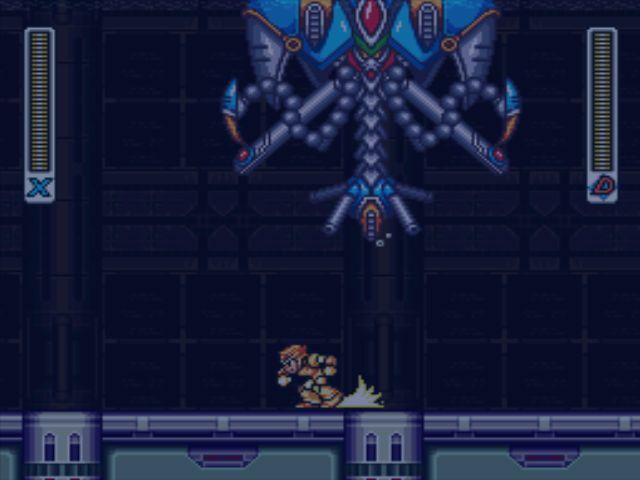 If you fight this next miniboss as X, nothing particularly special will happen, but if you beat him as Zero, stuff happens, and now you know this, meaning you get to decide of Zero lives or dies. Switch to Zero before heading through the door. This miniboss just won't appear if Vile is alive. Mosquitus is a weird miniboss. His colour changes depending on which floor... tile thing he latches on to. He can grab on to your character and severely damage them if you don't shake free. 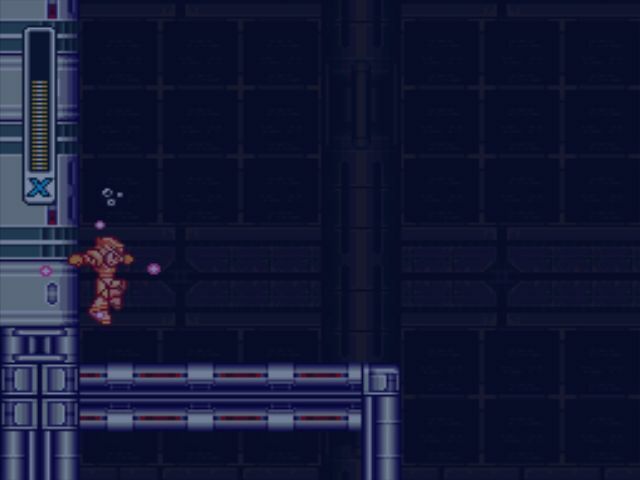 If you're playing as Zero like you should be, one swipe with your Beam Saber and one charged shot will be enough to bring him down. Right on top of you. Whoops! 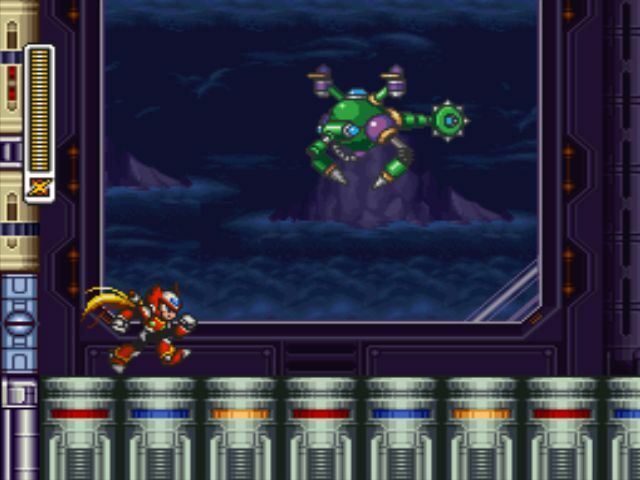 The boss will slowly float over to Zero, who won't even try to move, and explode. 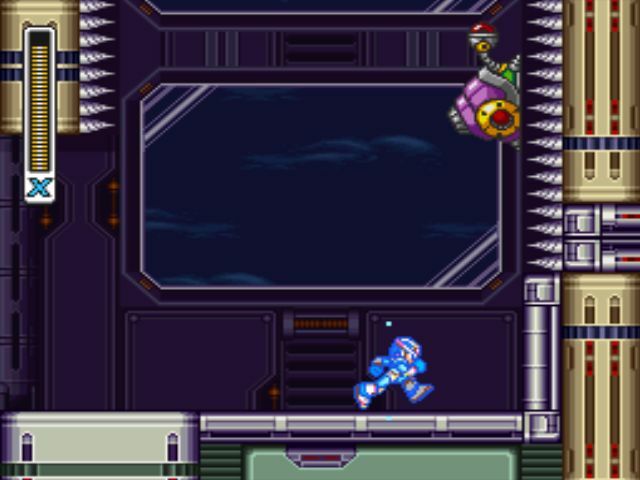 Zero will be badly damaged, because that's kind of Zero's thing. 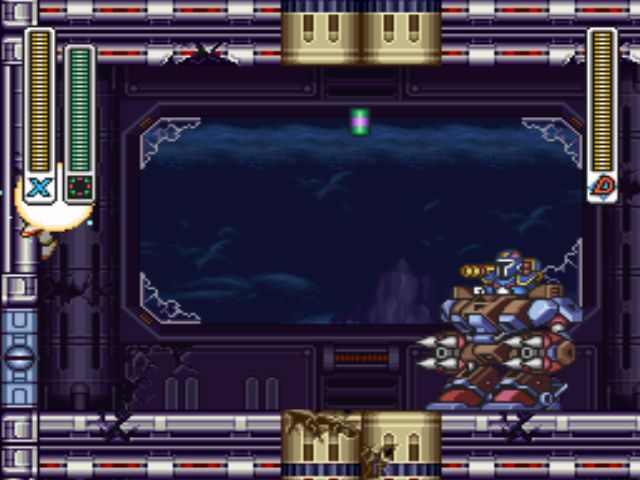 X will teleport in and Zero will retreat for repairs, leaving his Beam Saber with X. This adds another level of charged shot on top of the several you already have. Charge to a green glow, then fire your two regular charged shots. The final one will be a swipe from the Beam Saber, which is very powerful and sends out a projectile so it looks like X is actually better at using it than Zero was anyway. The only problem is that you can't use it on a wall. You'll drop off if you try. 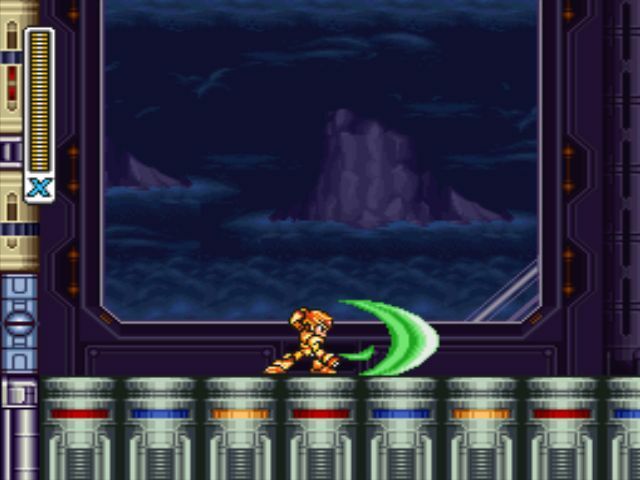 Unlike the Gold Chip, the Beam Saber can be saved with a password. Head right and try your new weapon on the Victoroid. Pretty great, right? Head right and up, and right more. Time for one more new enemy. These things are mostly just here to act as platforms. Destroy their shells and you'll be able to ride the remaining rods as these guys slowly climb these spiked walls that will definitely kill you if you touch them. Go up using the Escanails, jumping back and forth between them as needed. When you reach the top, head through the boss door and let yourself heal as needed. If you destroyed Vile, you'll have to fight this thing. It's weak to Frost Shield and Triad Thunder. 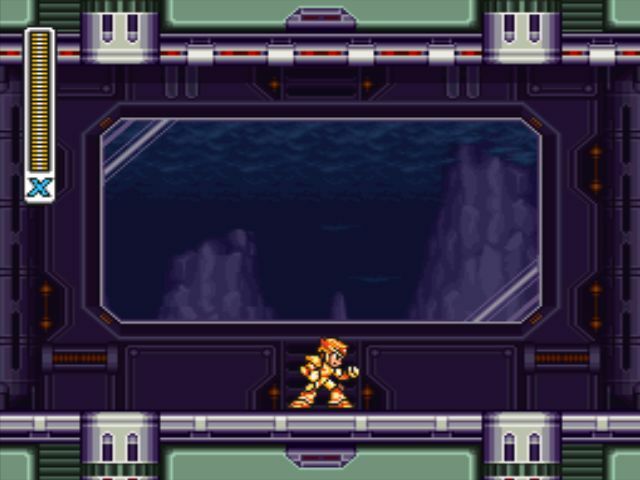 This fight takes place underwater. 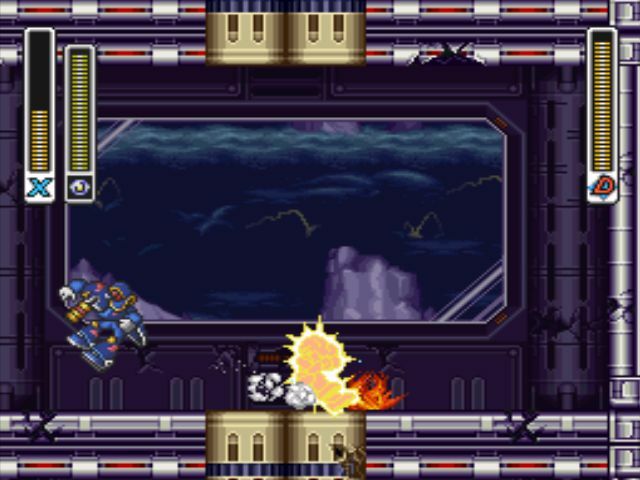 The boss shoots homing torpedoes and attacks with its tentacles. It throws the end parts of its tentacles like boomerangs. This is significantly easier than the fight with Vile. Especially if you have the Beam Saber, which can blow more than half of his life bar away in one hit. Get used to that. If Vile is still alive, Volt Kurageil won't be there, and instead, Vile will be waiting in the room beyond in a new Ride Armor. This armour is weak to the Parasitic Bomb and Tornado Fang. He'll charge at you and punch the wall, knocking you down. 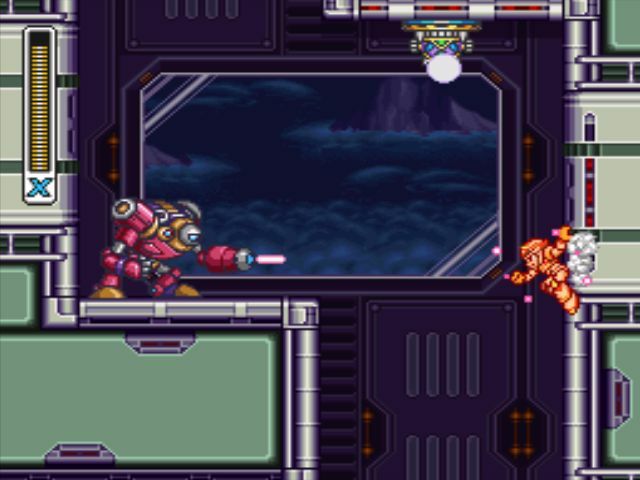 He can fire out projectiles that will turn to walls that will block your path. He can charge right through to destroy them. He has a charge shot that is similar to yours. He'll stand still to charge it, but you won't be able to take advantage of this and damage him because he'll be immune. The easiest way to defeat him is to just charge the Parasitic Bomb and let it automatically target him. This battle will be similar to the first time you fought him. The main differences are that his fire attack travels faster and he has an electric attack now that will split into multiple parts. If one of them hits you, it will stun you long enough for Vile to approach you and grab you to damage you. He's still weak to the Ray Splasher and Spinning Blade. You probably won't have to change your strategy too much from before. Use the Ray Splasher to attack him on the ground or the Spinning Blade if you want to stay close to him and let him jump around. Next up is the traditional Capcom boss gauntlet. You might want to make sure your sub tanks are full. None of the material contained within this site may be reproduced in any conceivable fashion without permission from the author(s) of said material. This site is not sponsored or endorsed by Nintendo, Sega, Sony, Microsoft, or any other such party. 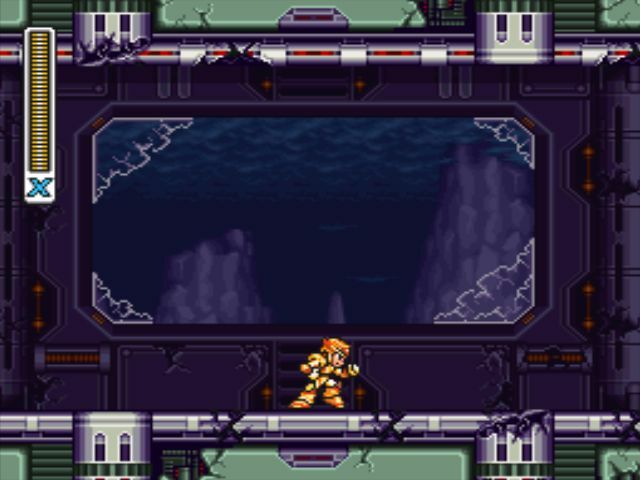 Mega Man X3 is the property of its copyright holder(s).